Be warned, this post contains spoilers for the Jedi knight class story, Shadow of Revan and KotFE/KotET. The first character I ever created in SWTOR was the trooper who's still my main to this day, and I can't remember which one of the two I made first, but Jedi consular and Imperial agent were among my first alts. This meant that my image of the Sith Empire and its Emperor was pretty... fuzzy for a long time. Even on my agent he was a mysterious figure, as nobody I talked to ever seemed to know where he was, what exactly he got up to, or even what he looked like. Whenever Darth Malgus talked about acting according to the Emperor's will in a briefing, he sounded more like a religious zealot spreading a divine being's message than someone conveying what they'd been told in a private one-to-one. If there had been a plot twist later on, revealing that the Emperor was long dead and just being used as a figurehead by the Dark Council, I would have easily been able to believe it. I realised I actually have no screenshots of the Emperor from the base game, so a shot of Malgus, who repeatedly claims to know the Emperor's will, will have to do. Let's just say, I was in for quite a surprise when I finally levelled a Jedi knight, and later, a Sith warrior. But that sense of mystery still stuck with me for a long time, also because Bioware kept writing the story arcs that continued the story at level fifty under the assumption that not everyone had played those two classes, so things needed explaining, yet the NPCs doing the narrating weren't exactly experts on the subject matter either. Was the Sith Emperor truly dead? It was fascinating to watch the story of a divided and confused Empire unfold on Ilum and Makeb. Then, Shadow of Revan happened. I didn't really have a horse in this particular race, having never played KOTOR at the time and only running a knight and warrior as relatively minor alts, but I always thought it was a bit cruel to Jedi knights to basically invalidate most of their class story. (You thought you heroically killed this guy? Nope!) At the same time it was a bit strange to make the Sith Emperor everyone's concern, from smuggler to bounty hunter. But I guess when the whole galaxy is in danger, one has to step in, regardless of one's prior role. The Emperor's new clothes existence as disembodied shadow entity reached its peak in the Ziost story arc, where it was revealed that he was not only still alive and around, but also powerful enough to perform mass mind control on Imperial citizens and destroy an entire planet. People were (rightly) asking where we could possibly go from there, but apparently the answer was: in a completely different direction, seemingly at random. In Fallen Empire, it turned out that the Emperor had had a second body in a different part of the galaxy all along and had used it to get up to all kinds of hijinks. He also appeared to have received a personality transplant and suddenly lost a lot of his powers, suddenly being very dependent on his body again. When KotFE was still very new, I wrote a somewhat frustrated post about this, hoping that some sort of explanation for what was going on was still coming. Now that we've reached the end of that story arc, I'm sad to say that this never happened. And for that reason, I'm actually pretty glad that Valkorion is dead, and hopeful that he will stay so for good now. Don't get me wrong, I did actually enjoy fighting against all three of the Sith Emperor's incarnations. I really liked how mysterious he was to most classes in the original story. I suppose the incorporeal, planet-eating version of the character was my least favourite, mostly because he had no motivations we could understand beyond being insane and the question of how exactly we were going to fight him was never really explored. Valkorion, while totally inconsistent with everything that had come before, was at least an interesting character ins his own right (which was undoubtedly helped a lot by Darin De Paul's excellent voice acting). Still, I'd love to have been a fly on the wall at Bioware when they decided how the KotFE arc should come about. At least from the outside, it looks more than ever as if they just wanted to get away from what had come before and create something completely different. Claiming that Valkorion was actually the Sith Emperor was simply a weak way of retaining some kind of tie to the existing story, even if it made no sense for a being in his position to suddenly go back to being trapped inside and dependent on a single body. Either way, I think he's been used for all he was worth and then some. It's time to give the guy some rest and let galactic politics unfold without him. I was ready for that by 2.0, and I'm still happy to see what's coming now. The most annoying thing about the inconsistency surrounding Vitate's evolution into Valkorion is that most of the answers surrounding the inconsistencies have mostly been explained via Hall Hood's Twitter account and not actually in-game. The basic points are as follows. 1. The Ritual had multiple angles; the Knight only prevented the aspects which were affecting the Core Worlds, and the Eternal Fleet was actively scouring Wild Space. 2. 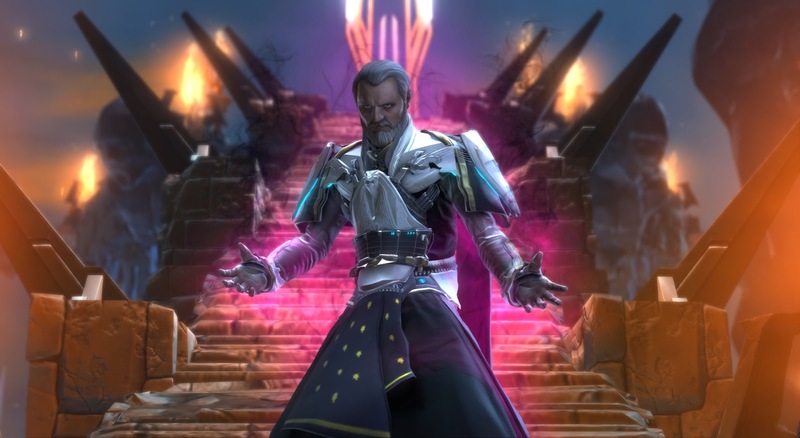 The Knight destroyed much more than just the Emperor's Voice on Dromund Kaas; they practically damaged his whole spirit to the extent that he was as good as dead. This is what necessitated devouring all life on Ziost; not as a show of power but as a means to recover fully, since being revived on Yavin was "not enough". 3. Vitiate was still considering going ahead with the ritual following his rebirth, but had a change of heart upon seeing how Zakuul had flourished during his absence. 4. It is unknown whether or not he had considered Zakuul's safety during this ritual or whether he had just used it as a distraction and was perfectly happy to let it end. Already there are a good number of issues to come from this. Firstly, with the Eternal Fleet being on a rampage, how did they know when and where to stop during Vitiate's year of near-death? The extent of Valkorion's autonomy during this time is unspecified, and it's unlikely that Vitiate would have programmed a limit into the Fleet given that their main purpose was to provide fuel for the ritual. Furthermore, what stops them from accidentally attacking Zakuul itself? Additionally, I know Wild Space isn't prime scouting territory for the denizens of the Core Worlds, but surely somebody would have noticed such a large fleet as this going on a rampage through telescopes or satellites? 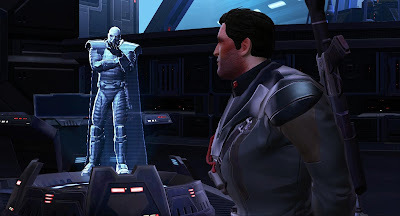 Secondly, it is important to stress that Vitiate was 'dead' for only a year once more based on the claim that Zakuul prospering during this time is what made him reconsider his original decision to stop consuming the galaxy. We don't know how much Vitiate saw of Zakuul through Valkorion's eyes before his near-death, but even then how much would realistically have changed for Zakuul in the first place? Thirdly, if Vitiate was always planning on consuming Zakuul - or even if he didn't care that it could possibly be consumed - why devote so much effort to what is essentially a flight of fancy? I know the Sith Empire became boring to him after a while, but there surely must have been better things to do than essentially focus on restructuring one singular planet? Finally, knowing what we do sort-of know now about the Zakuulan Old Gods being six Machines of War that probably earned their status as a pantheon by destroying large portions of Zakuul and other planets as part of weapons tests mentioned in the current Iokath Codex Entries, why are these weapons of mass destruction left totally alone by Vitiate? If he cares about the mythology of the planet's Old World, he must surely be aware of these Gods and thought that maybe there was something to check out. The idea of him being a god-conqueror who bent these six deities to his every will is surely something that he'd have loved to be known as. 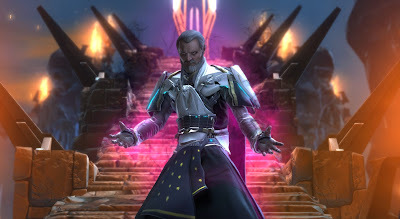 Heck, if the Eternal Throne itself is actually potentially Iokath in origin (there has to be some reason why the Fleet which hailed from Iokath responds to it; heck, maybe there are even more Thrones on Iokath itself), he must have known about Iokath technology and how to control it. The Pantheon could themselves thus have been used as weapons for the ritual. Not even these explanations offer much by way of 'closure'; there's still a ton of confusion about virtually every single point. I'm thankful in some ways that all of this is left out of the game as it currently stands for an explanation, but there could have been at least some attempt at better integration of it all. Yeah, somebody basically tacked him down and asked a series of questions. They posted the questions and replies on Reddit, which was really helpful for my comment since Hood has temporarily closed his Twitter account. And that should have been "tracked"; they didn't literally stick him to the floor with pins. Perhaps they should have. Pinned him to the floor, I mean; at least virtually. Reading that reddit thread on April Fool's Day sure was an interesting experience at first (everyone's name is changed to Musco, lol). It's rather more headcanon that canon-canon (and I still need to actually run a Sith through to the start of KotFE), but having run 3 pub force users and an agent through most/all of KotFE and one trooper through KotET; I got the definite impression that the Eternal Empire was Big V's focus and the Sith Empire the distraction/experiment. (Marr's "Your long silences throughout our history" line makes more sense when read that way.) And I almost see that Vitiate makes more sense as a semi-independent subsidiary entity of Valkorian. (This conflicts with the novels between KOTOR and SWTOR, from what I understand, but hey). It's not just your headcanon; he does actually explicitly say that Zakuul was his focus and the Sith Empire his side project. I think it's in KotFE chapter 2 if you choose certain options as an Imp? I got tired and petered out before I got to the headcanon bit; which was that Vitiate and Valkorian were (essentially) two parts of the same spirit, split apart at some point. They would regularly meet and sync up, but they slowly drifted apart, until Vitiate was a universe-destroying omnicidal maniac, while Valkorian was more into hands-on villainy. So, when Vitiate flees to Wild Space, he is reabsorbed by Valkorian, and roll opening credits for KotFE. I love this post. You pinned down exactly why I feel reservations about the Emperor character, even though I really enjoyed KOTFE and KOTET. The different game design periods shine through the character too much. The Emperor's story has three distinct parts, and it doesn't feel entirely believable as a whole.